Exposure is important. PV panels can be mounted on a south-facing roof or on ground supports. In either case, there should be maximum exposure to direct sunlight. Carolina Energy Conservation can help you decide if a solar photovoltaic system is right for you. We can right-size and install a solar panel array. During a free solar system evaluation, Carolina Energy Conservation can explain the differences between solar PV and solar thermal systems, and help you decide which system is best for your house. A smart choice. Solar panels are low maintenance and will work effectively for years. Not many solar energy companies have all the solutions and services that Carolina Energy Conservation has. We provide free evaluations and quotes for solar panel installations in South Carolina. Call or email Carolina Energy Conservation today for a Free Quote on a solar energy system. Call 1-855-410-0662 or contact us online to schedule a free solar photovoltaic system quote and see if a home solar powered system is best for your residence. We service: Myrtle Beach, Charleston, Sumter, and surrounding areas including Bluffton, Florence, Mount Pleasant, North Charleston, Darlington, Beaufort, Goose Creek, Blythewood, Summervile, Pawleys Island, Lancaster, Conway, Orangeburg, Hilton Head Island, Charlotte and more. At a time when energy costs are constantly threatening to rise, solar water heating can provide 50-80% savings off your heating costs now and for 30 years into the future. In addition to reducing your monthly utility bill, solar can increase the value of your home and provides an appealing sales feature. The government is doing its part to make solar water heaters more appealing. The federal government currently offers a 30% tax credit for any money spent purchasing or installing solar water heating technology. On top of that, many states offer additional incentives to encourage investment in solar technology. In South Carolina, taxpayers may claim a credit of 25% of the costs of purchasing and installing a solar energy system for heating water. 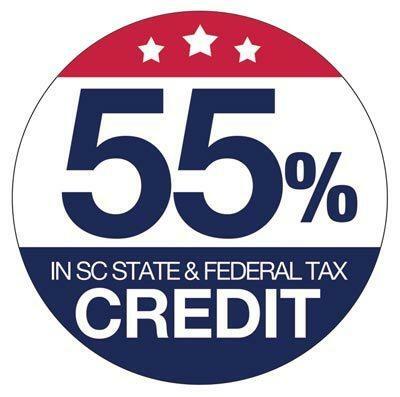 The maximum credit a taxpayer may take in any one tax year is $3,500 for each facility or 50% of the taxpayer's tax liability for that taxable year, whichever is less. Unused credit, or credit that exceeds the annual cap, may be carried forward for 10 years.